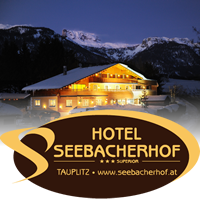 "Seebacherhof" is a family-run 3-star hotel in Tauplitz, in the heart of the Styrian Salzkammergut area. After our hotel has been modernized Seebacherhof this spring and summer and expands, we are pleased to now especially in the upcoming winter season to start. The "new" Seebacherhof now has a total of 69 beds and is run as a 3 star superior. In the course of restructuring its own bar is created, and a cozy sauna with panoramic views and a new reception and foyer. A modern hotel elevator, allowing guests to reach the rooms comfortable even with luggage. Enjoy some well-earned vacation days with us. We look forward to welcoming you in our "new" Seebacherhof be allowed because it's nice to count you among our guests. Flee from the hustle and bustle of everyday life. Feel at home, relax and unwind and do something for your health. A nice dream? Not with us. We do our best to spoil you from top to bottom and to help you to enjoy life experiences you believed to have lost long ago. Enjoy a few days of relaxation. Whether you want to spend a relaxed weekend, a short break with your family or want to spend your holidays with us - we are experts in making holidays worthwhile. Our house is in central yet quiet location and a perfect base for skiing, snowboarding and cross-country skiing in winter and swimming, cycling, mountain biking or hiking in summer. If you like variation Tauplitz is a perfect base for your holidays. The base station of the modern 4-seater chairlift of the Tauplitzalm skiing and hiking paradise is only a 5-minute ride from the hotel. We can also bring you there with our private bus. In winter and summer alike, Mario Seebacher and his team welcome you at the well-known and popular Pfannerhütte hut, directly at the downhill. In summer time the hut can be easily reached by foot from Tauplitz. Hotel guests enjoy a free welcome schnapps! You can also visit Sportalm dancing paradise (part of the hotel) where dance music for the young and old is played and events, darts or entertaining games take place on Wednesdays. Hotel guests enjoy free admission! Your guest rooms are comfortably furnished and feature shower/WC, satellite TV, mini bar, telephone, radio; some rooms have balconies. More Information: To get more information than just the location of our hotel, please click on the red marking on the map. A speech bubble pops up. Calculate route: To determine your driving route to our hotel, please enter the post code and the town from which you start your journey and click on “Calculate Route”. A new window with a map and the route description opens. Exact location in the village: Click on the "+“ symbol in the upper right part of the map until the map is large enough. Please let us know your travel dates. Would you like to book a package? Form of address:* Please select... Family Ms. Mr.
From your room you enjoy a fantastic view of the surrounding mountains. Here you can relax and recharge. The restaurant waits to be discovered by you. Our prices are in EUR and per person and night. Here you find child discounts at Hotel Seebacherhof in the Ausseerland-Salzkammergut in the village of Tauplitz. All discounted prices are rounded up or down to full ten cents.